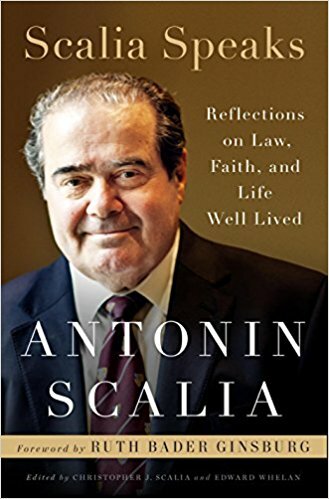 The anthology was assembled by the eighth of Scalia’s nine children, his son, Christopher Scalia, and by a former clerk, Edward Whelan, who president of the Ethics and Public Policy Center. I only needed to read the introduction and two of his speeches to know this is one rare (for me] 432 page long book I will actually read cover to cover. In the meanwhile I thought I would re-run for my edification and hopefully yours Mr. Stark’s thoughtful piece on the late Justice’s positions on abortion and assisted suicide. U.S. Supreme Court Justice Antonin Scalia believed that the role of the Court is to faithfully interpret and apply the law as it actually is—not as the Court wants it to be. Making law and policy is the job of the elected branches of government. Judges, he insisted, should not be legislators. The issue is whether [abortion] is a liberty protected by the Constitution of the United States. I am sure it is not. I reach that conclusion … for the same reason I reach the conclusion that bigamy is not constitutionally protected—because of two simple facts: (1) the Constitution says absolutely nothing about it, and (2) the long-standing traditions of American society have permitted it to be legally proscribed. The notion that the Constitution of the United States, designed, among other things, “to establish Justice, insure domestic Tranquility … and secure the Blessings of Liberty to ourselves and our Posterity,” prohibits the States from simply banning this visibly brutal means of eliminating our half-born posterity is quite simply absurd. One will search in vain the document we are supposed to be construing for text that provides the basis for the argument over these distinctions; and will find in our society’s tradition regarding abortion no hint that the distinctions are constitutionally relevant, much less any indication how a constitutional argument about them ought to be resolved. The random and unpredictable results of our consequently unchanneled individual views make it increasingly evident, Term after Term, that the tools for this job are not to be found in the lawyer’s—and hence not in the judge’s—workbox. I continue to dissent from this enterprise of devising an Abortion Code, and from the illusion that we have authority to do so. American law has always accorded the State the power to prevent, by force if necessary, suicide … [T]he point at which life becomes “worthless,” and the point at which the means necessary to preserve it become “extraordinary” or “inappropriate,” are neither set forth in the Constitution nor known to the nine Justices of this Court any better than they are known to nine people picked at random from the Kansas City telephone directory. Unless we are to repudiate a long and well-established principle of our jurisprudence, using the federal commerce power to prevent assisted suicide is unquestionably permissible. … If the term “legitimate medical purpose” has any meaning, it surely excludes the prescription of drugs to produce death. In Roe v. Wade and subsequent decisions, the Court usurped the authority of the American people and their elected representatives to determine abortion policy—and 58 million abortions have been the result. Some people want the Court to do the same with assisted suicide. To prevent that from happening—and to reverse Roe, allowing for greater protection for unborn children and their mothers—we desperately need more Supreme Court justices like Antonin Scalia. Editor’s note. Paul Stark is Communications Associate for Minnesota Citizens Concerned for Life, NRLC’s state affiliate. If you like, join those who are following me on Twitter at twitter.com/daveha. Your feedback is very important to improving National Right to Life News Today. Please send your comments to daveandrusko@gmail.com.